Today we landed in Abu Dhabi, UAE! We have an overnight layover so we planned to get settled and then go out and see the city. After checking in, dad and I went to work out. As I played worship music out loud in the hotel “gymnasium”. I couldn’t help but think about the Middle East and the battle between Islam and Christianity. Here in Abu Dhabi, it’s the month of Ramadan. You cannot eat or drink in public until sundown. It’s so interesting to be in a middle eastern country during this time. Laying on the yoga mat doing abs, I just kept thinking how I wanted to shout about Christs love and freedom. Christianity is such a unique religion because instead of rules, one finds freedom and deliverance. It’s not about works but about grace. Anyways, we came back and took the shuttle to Yaz Island. While riding, I really got a chance to observe the landscape. 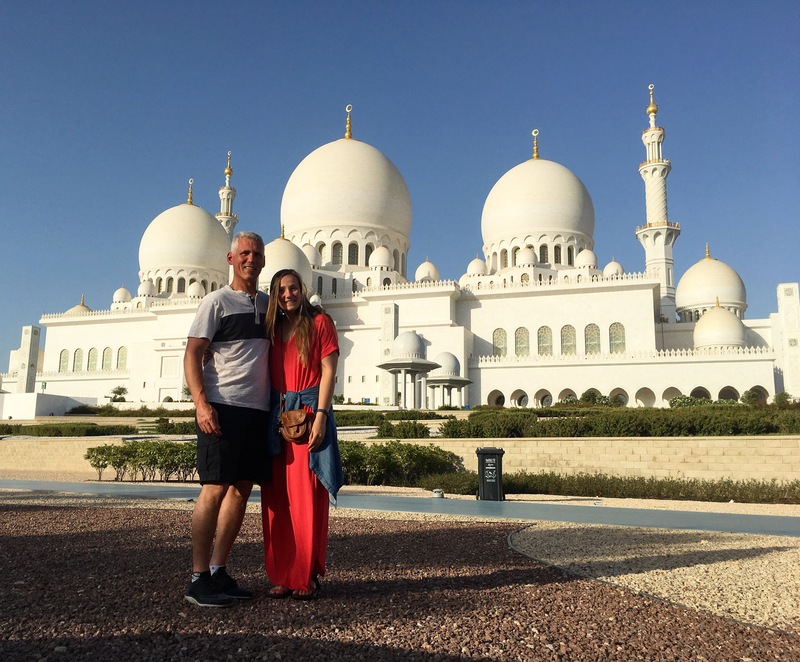 Abu Dhabi is very much the desert. All the trees have been imported from elsewhere. Basically it’s just a sandy island. The bulk of the infrastructure that comprises Abu Dhabi has been built up in the last 15-20years. 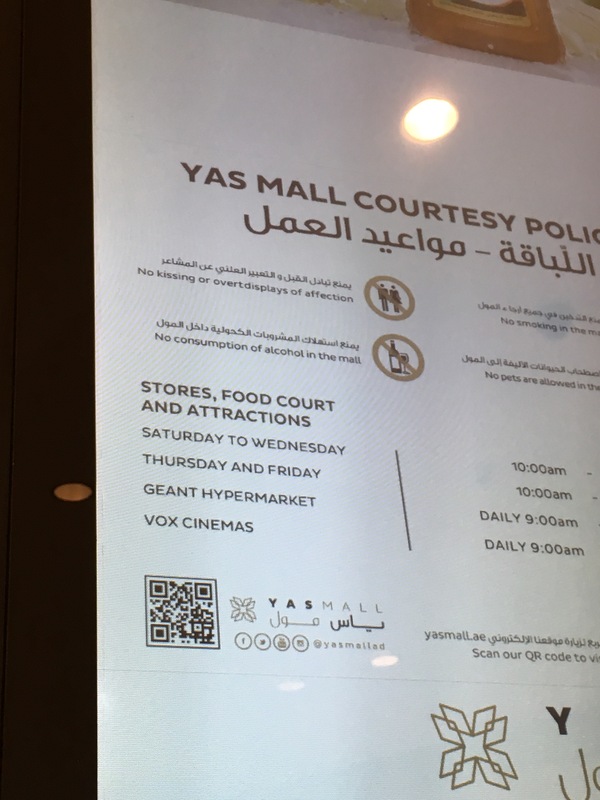 We arrived at Yaz Island and walked around the mall before exchanging our money and flagging a taxi. Our taxi driver, Mohammed, first took us to see The Grand Mosque. I don’t think I can put the structure of the mosque into words. It was regal and beautiful and ginormous. Standing in front of it, I just felt small. Up to 40,000 people can worship there at a time, and the sound that signals Muslims to pray is generated from the Grand Mosque. As our taxi driver drove us to the next destination, we learned that he migrated here from Pakistan and is also a Muslim. We talked about us being Christians for s little. That was my goal – that we bring up Christ somehow. 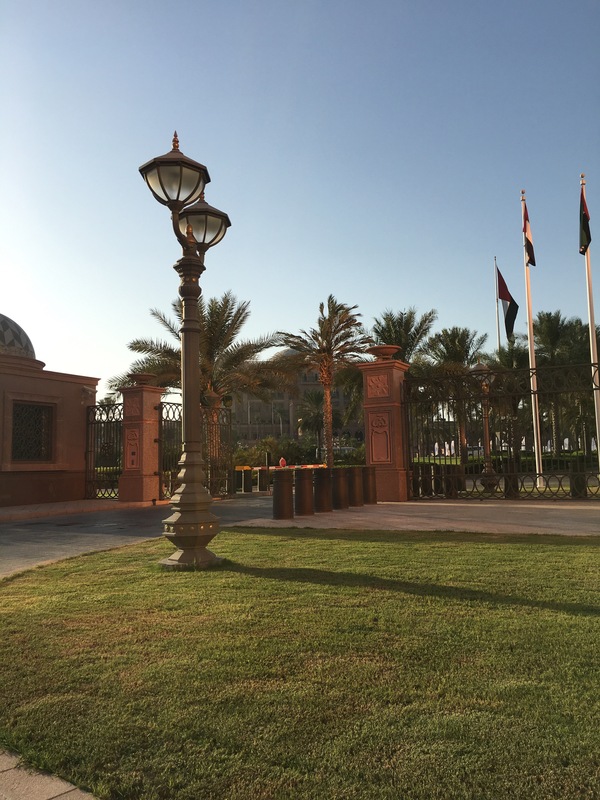 We arrived at the Emirates palace. Unfortunately we were not allowed to enter since my dad was wearing shorts. However, if you stay there, you’re allowed to wear shorts..so it’s kind of a confusing policy. Speaking of dress codes. Randomly, while walking around, you’ll see men dressed fully in white robe like attire with a white head covering. Women are dressed fully in black only showing their eyes. 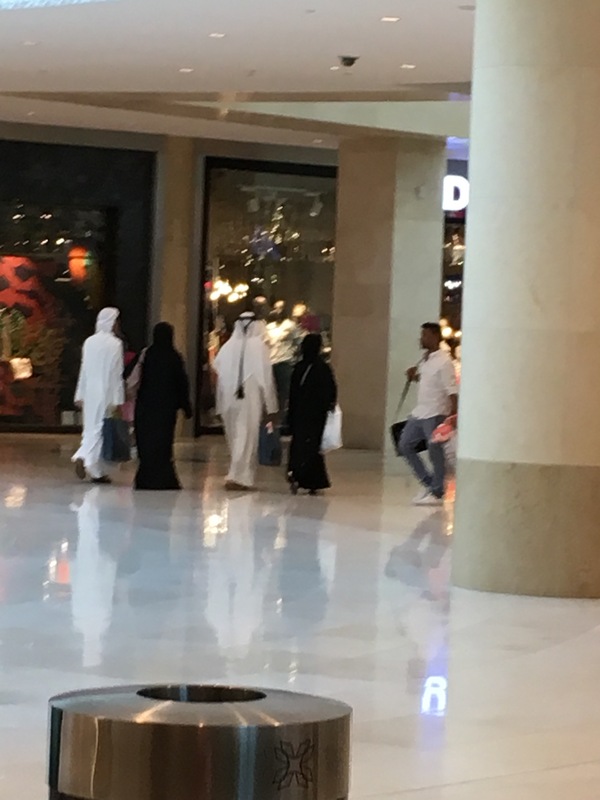 We asked Mohammed about it and he said the people who dress in this manner are the original citizens of Abu Dhabi – not immigrants. 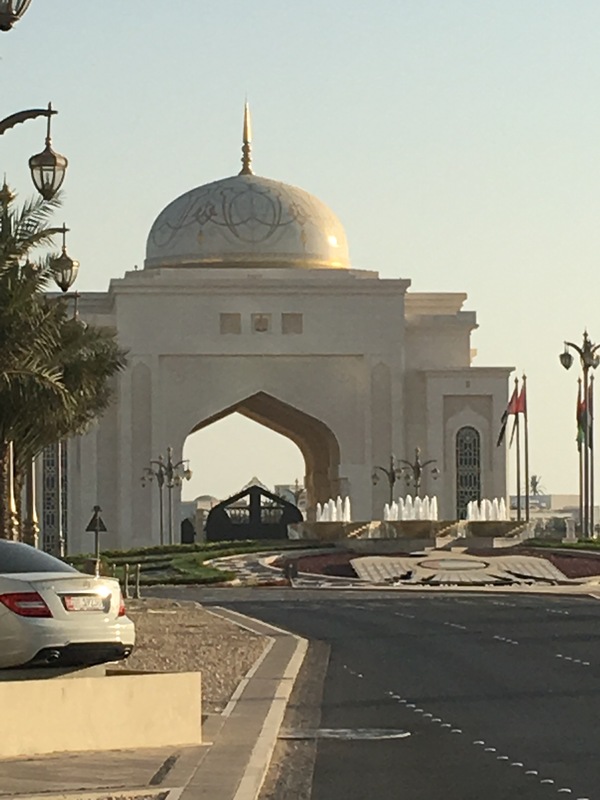 Mohammed said that Abu Dhabi is so peaceful. At all hours of the night in all areas it’s safe. That’s pretty incredible and one of things that drew him to the city. 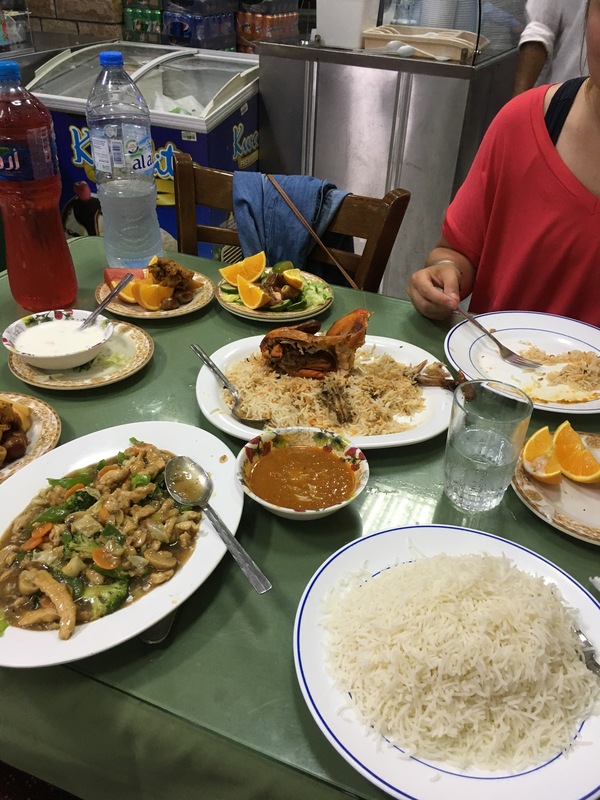 Being Pakistani, Mohammed convinced us to eat Pakistani food. 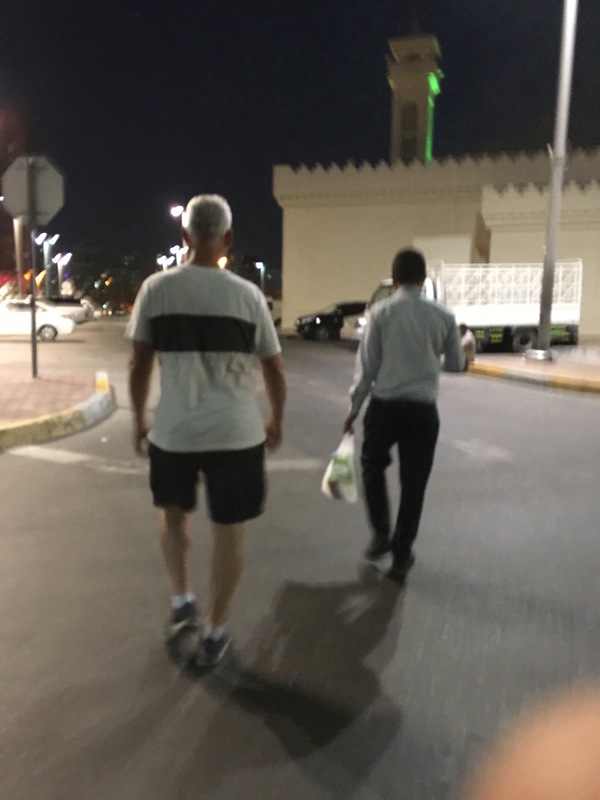 We could not eat until sundown – due to Ramadan, so dad and I walked around downtown. It is hot hot hot here! It was probably 105 degrees with no real wind. Needless to say we were ready to get inside to the air conditioning. I ordered chicken buryani which is a spicy rice and chicken dish. Dad ordered rice chicken and vegetables. We got a ton of food all for 14 dollars. Mohammed then drove us home where dad offered prayer but Mohammed said he was okay (you can always ask right?) and are now hanging out in the hotel before our 8:30am flight tomorrow to entebbe, Uganda! It will probably not belong before we both fall asleep due to travel and time change.